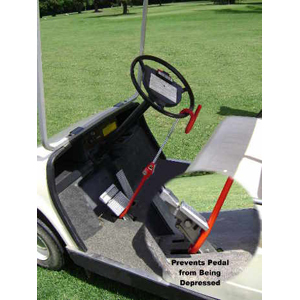 Stop professional thieves and joy riders from taking your golf cart with the Club Golf Cart Pedal-to-Wheel Lock. From the makers of the original Club steering wheel lock, the Golf Cart Pedal-to-wheel lock attaches the brake pedal to the steering wheel, preventing thieves from both steering the cart and using the brake, which deters theft. Prevents the vehicle from being steered.